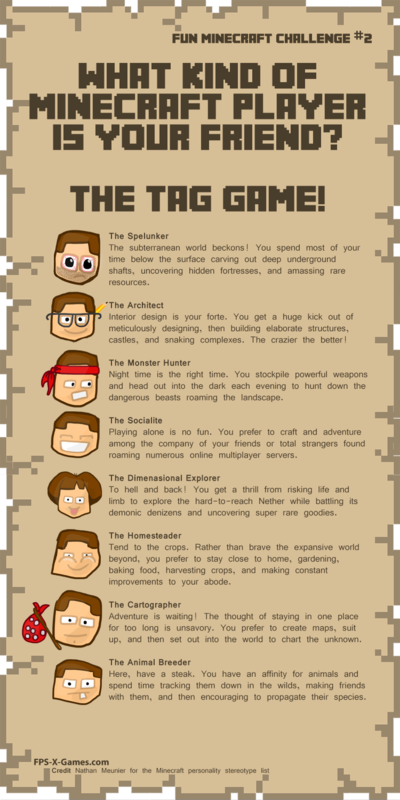 What Minecraft Player Type is your Friend? Social Tag Game. Number Two in the "Fun Minecraft Challenge" . What type of Minecraft player is your friend? Social tag game, simply share the (Minecraft Player Type) image to your Facebook or Google+ wall, pick a player type and tag a friend. Credit Nathan Meunier for the Minecraft personality stereotype list. Got an ideas for the next Fun Minecraft Challenge? Let us all know in comments below, thanks! Happy tagging.